Boating industry bikers from across the country are throttling up this weekend for the official launch of "Pacific Coast Rush," a week-long escorted motorcycle tour from Seattle, WA to San Francisco, CA, including a two-day swing down to Big Sur and Monterey. As part of the "Boaterz 'n Bikerz of America Hull of a Tour" series originally launched in 2011, this summer's cruise kicks off Saturday, July 23 and features a full week of scenic mountain and waterway riding including stretches along the famed Pacific Coast Highway. 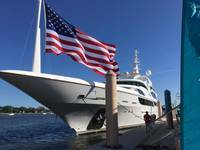 The tour is one of a kind, bringing together a few dozen boating industry and motorcycle enthusiasts from Florida, Ohio, Washington State and California. "Pacific Coast Rush will be awesome, launching amid the spectacular mountains of the great Northwest, then traveling south via the most stunning coastal roads of California, with rides along the rim of Crater Lake in Oregon and winding through the majestic Redwoods, encompassing multiple beach and iconic west coast destinations," said Hull of a Tour Event Organizer Wanda Kenton Smith. Wanda added: "Our first tour in 2011 traveled 3000 miles from Destin, Florida to San Diego, CA, while last year's Freedom Ride covered 2000 miles from Sarasota, Florida to Washington DC. This year, our road captain Jim Krueger of Regal Marine has planned another 2000-mile boating and motorcycling extravaganza that covers some of the most breathtaking geography and terrain in all of North America." As is tradition and a unique component to Hull of a Tour rides, boating activity is an integral part of the agenda. This year's tour includes a scenic brunch cruise and tour launch July 23 in Seattle aboard a 78' Ocean Alexander motoryacht, courtesy of sponsors Alexander Marine USA and global manufacturer Regal Boats. The splash down finale in San Francisco on July 30 features a "Sunset Sailabration" cruise aboard a large party catamaran on San Francisco Bay, hosted by 2x returning title sponsor Freedom Boat Club, the largest and oldest boat club franchisor in North America. "We are very pleased to sponsor and support the Hull of a Tour as members from the boating industry celebrate the freedom and adventure that boating and motorcycling offer," said Freedom Boat Club President and CEO John Giglio. In addition to Freedom Boat Club, Regal Boats and Alexander Marine USA, Soundings Trade Only serves as the official boating industry/trade media sponsor and Kenton Smith Marketing as the event producer and publicist.